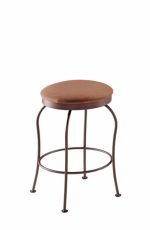 Trica Kim 17½" Backless Stool for Bathrooms, Bedrooms - Free shipping! Higher density foam, adds more padding to the seat. This beautiful, minimalist chair offers a comfy round seat and a ring foot rest. 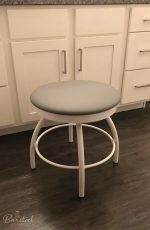 This 17-inch stool is great for makeup stations in bathrooms or bedrooms, breakfast nooks in kitchens and children’s rooms. 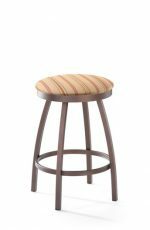 With a width of 16½”, this small stool can fit most narrow spaces or can even be tucked away when not in use. 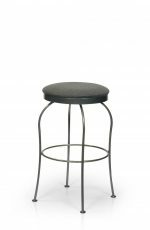 The Kim is the perfect traditional style vanity stool that plays well with almost any style of decor. 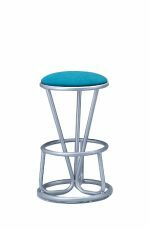 Available in a variety of powder-coated metal finishes including anthracite, black, blue, brushed steel which matches stainless steel appliances, chocolate, cotton off-white, glossy white, gold, golden brown, meteor, orange, platinum, silver, taupe, and more. Available in a variety of comfortable fabric colors including ballad 030 dark navy, cube 400 mustard yellow, cube 801 medium gray, highland 701 plum, highland 901 medium sand color, journey cotton candy pink, journey gunmetal dark blue-green, mozart 008 red, mozart 040 black, notion tang orange, pin striper denim blue brown yellow stripes, venue cumin dijon mustard yellow, and so many more. Available in a variety of heavy-duty leathers including barolo cashmere gray, barolo cherry red, black, santiago godiva dark chocolate brown, santiago ivory off-white, santiago slate light gray, and more. Available in a variety of wipe-off-ready vinyl including aspen sea spray seafoam light aqua, austin cloud white, celestial dove dark teal, coachella otter gray taupe floral pattern, crazy horse saddle brown, dakota 040 black, dakota 100 white, dakota 304 blue, shimmer bronze, soft touch black, wicker park chocolate, and more. • Currently ships within 4-5 weeks. • Free shipping in the USA (except for Hawaii or Alaska) and Canada. Want to use your own fabric/vinyl? Have a fabric you love? 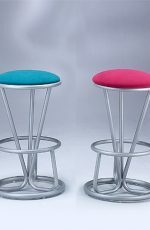 Trica will upholster your stools with it. 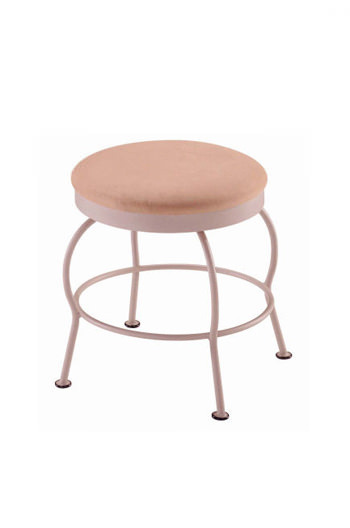 • For the Kim Backless Swivel Vanity Stool, you will need 0.80 yard(s) per chair. 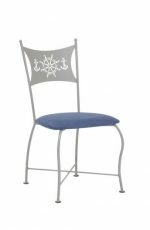 • For the comfort seat, you will need 1.75 yard(s) per chair. Please make sure this is an upholstery fabric or vinyl. 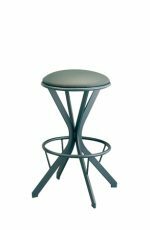 Trica furniture ranges from traditional to ultra-contemporary design, customizable with dozens of wood tones, fabrics, and metal finishes. These products add a fashion statement to any décor. All pieces are made in Canada using green manufacturing processes and cutting-edge technology. There's no weight limit to a Trica seat! 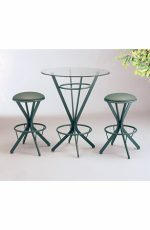 The stools and chairs use 14-gauge steel with an attractive and long-lasting powder-coated finish that won't wear off. All of Trica's products are fully welded — they don't use any screws — to guarantee they won't loosen up. You also get the best wear-resistant vinyl and fabrics in the industry, which are easily washable with mild soap and water. All paints used are environmentally safe, lead-free and non-toxic. You can rely on Trica for durable furniture that lasts for years. 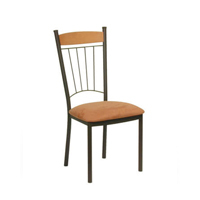 As the ultimate proof of quality, every chair and stool design has passed an intense Quality Control Test. This test simulates a 250-pound person sitting down and standing up 10 times a day, 365 days a year for 10 years straight — 36,500 cycles in all!